I find myself in situations all the time where I'll be having a conversation with someone and they'll say something so profound, so all I want to do is ask them, "what's your point?". I don't mean to to be rude, I literally just want to know what they're talking about! The phrase has such a negative connotation that it's reached a level where it must sarcastic; asking someone "what's your point?" is just another way of hinting at them that their words and opinions mean nothing. However, sometimes there just is no other way to ask someone what message they are really trying to portray! So, I need your help. 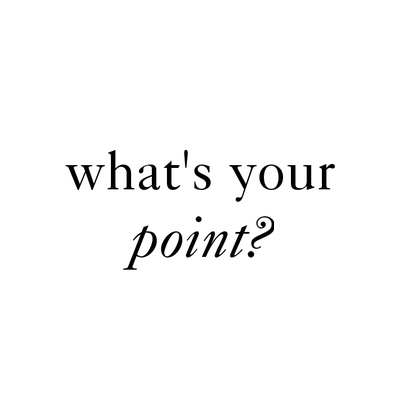 How do you feel about asking someone "What's your point?"? Do you have any alternative suggestions for the phrase? I totally agree! I usually just say something like "wait what?" Or "what do you mean exactly". Most of the the time I'll have like a weird confused look on my face though and people can usually tell I don't quite get it lol. hehe just kidding! I think it totally depends on your tone when asking this question. some people might get offended, others would be glad to elaborate! I think an alternative is "what do you mean?" I agree with Chlo, it really depends on your tone, but it sometimes can come off as a little snarky. Another way to say it would be "can your rephrase that? ", as lame as it sounds! I agree with Chloe and Carin! It tooootally depends on your tone when you say it! The phrase doesn't have to sound rude if you don't want it to be! I myself am an entirely purpose-focused person. I have absolutely no motivation to engage in conversations or do things that I cannot see the purpose of. It's just the way our brains are wired- some people are perfectly ok with doing things "just because" and saying things "because they feel like it." I think those of us who constantly need purpose and meaning should learn to be ok with the fact that some things "just are." Unless you're referring to something you don't understand- which, in that case, I think the appropriate inquiry would be "I don't understand," or "what do you mean?" "Point" is synonymous to "purpose" in my opinion, which is why I interpreted this post as always wanting meaning.